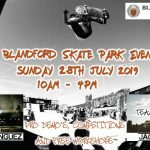 Hayle skatepark is a large concrete park made up of two adjacent bowls, one larger and more complex and the other being the smaller, more standard shape. The main bowl here is a large, unusually shaped one with a cradle in one corner and a vert wall along one side. Opposite the vert wall is a roll in that doubles as a volcano style spine and leads into the main body of the bowl. The bowl is flat bottomed and there are a lot of little corners and speed bowls to pump around to gain speed without even having to push. The second bowl here is the more usual shape and features a rectangular section with a deep and tight speed bowl attachd on one side. 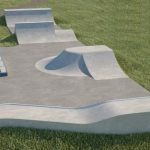 The rectangular section here also doubles as a half pipe and has a roll in halfway along one side and the end of this bowl backs onto the main bowl to form a spine between them. 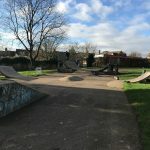 Hayle skatepark is a great bowl park and there is something for transition riders of all abilities here, if you are just starting out you can practise the basics in the beginners bowl or if you have some experience already and want the challenge then the main bowl is there too. It is definitely worth heading down here as you could spend a whole day here pumping around the bowls and hitting every line. Hayle train station: Exit Hayle station onto Bay View Terrace and follow the road until the crossing with Chapel Hill. Turn left here and then right onto Commercial Road and follow this road as it turns into Fore Street and Copper Terrace. Eventually you will see Lethlean Lane on your left, take this road and Hayle skatepark will be on your right. Phillack Turn bus stop: Exit the bus onto Lethlean Lane and head north until you see Hayle skatepark on your right.